Want to pack on some lean muscle mass? Is so, you have two ways to do it. One is the old school "bulking" and "cutting" approach. Basically you go on a see-food diet (i.e. eat everything in sight) and gain muscle with a substantial amount of fat in the process. While this is obviously not healthy, this approach also hides your hard-earned muscle most of the year and and makes it difficult to keep the muscle on while losing all the fat (especially if you are drug free). 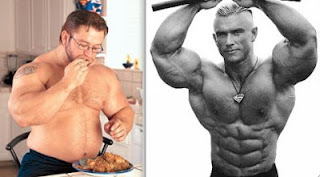 The other option is to manipulate your nutrition to maximize lean muscle gain while minimizing (i.e. not completely eliminating) fat gain. This way, your health, performance and aesthetics don't suffer in your pursuit of muscle. If you want to try option two, then keep reading! Yes, that is the same guy! Lean gains start with things that I have already written about. First check out Nutrition Tips for Muscle Gain Part 1 and Part 2. You also want to ensure that you are applying (as appropriate for you) the princples of Clean Eating and Nutrient Timing. Take as much time as you need to consistently apply this information. Once you have done that, you can go to the next step - carb & calorie cycling for muscle gain. To gain muscle you have to eat a caloric surplus (i.e. eat more calories than you need). The down side with this is that you can get fat doing it. Also, your digestive system will appreciate the break from the heavy eating. Low carb days are best for days when you are not training. They serve as days to focus on fat loss. Stay with the basic meal template and add 1-3 servings of fresh fruit (total per day, not per meal). Those who are really naturally skinny may still want to add some good carbs for breakfast to this meal. Stay with the basic meal template, add 2-3 servings of fresh fruit per day. Those who struggle with body fat gain should save the carbs for the post-training time and keep to more low-carb meals the rest of the day. Those who struggle keeping weight on can use more carbs post training and possibly for breakfast. Follow the basic meal template. Add healthy carbs to each meal and fresh fruit to most. Still follow the basic nutrient timing principles and push the bulk of your carbs to the post-training time. If you are naturally really skinny, load up on the good carbs on this day. If you naturally struggle with body fat gains, you may want to eat lower carb on meals away from your post-training window of opportunity. How many low/moderate/high carb days do I get per week? Being lean. The leaner you are, the more carbs you get and thus the more high carb days per week and the greater amount of carbs on those days. Training volume and intensity. The harder and longer you train, the more carbs you get. Those who are training 4-6 days per week can get more moderate and high carb days. When should I schedule high, medium and low-carb days? Try matching your high and moderate carb days with your training days and your low carb days with your off-days. The obvious sign of too many carbs is fat gain. 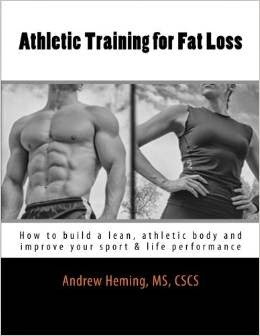 (See this post on A Simple, Cheap Way to Monitor Your Body Composition for more details). The other thing to watch for is sluggishness. Some people just feel and perform better with less carbs. In the past, when the low-carb craze was reaching its peak, I experimented with low carb eating. For my body type, it was a big mistake! Assuming you are training hard, eating enough protein (i.e. 0.8-1g/lb of body weight) and have some healthy fats in your diet, and you are not gaining muscle, chances are you need more carbs. Also, a decrease in performance, muscles that feel "flat" or legs that feel "heavy" can be signs of glycogen depletion and an indicator that you need to get some more carbs in your diet. I wish you all the best with your lean muscle gaining! Roussell, M. Carb cycling for idiots. www.t-nation.com, 2007.